On the "Step 1" screen, we enter name, age and weight of the person who might be vaccinated. The name is for whom you are creating the Vaccination Plan. Age can be entered in weeks (0-7), months (0-35) or years. 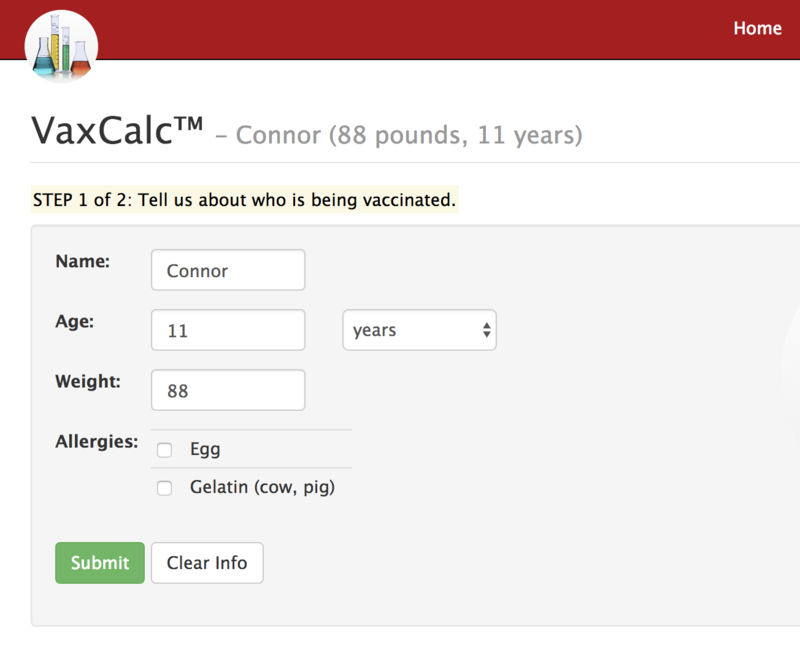 VaxCalc will use age to filter out vaccine brands that are inappropriate for that age group. For example, a 15 year old should not be given DTaP and a 5 month old should not be given the flu shot. Weight is used for calculating "possibly safe amounts" of aluminum and thimerosal. If you select one or more allergens, VaxCalc will provide a special warning if you choose a vaccine that contains that ingredient. The "Clear info" button removes all the personal information from your VaxCalc session. You can easily return to this screen from anywhere in VaxCalc by clicking on the upper-left VaxCalc-flask logo.